To the lady who has dealt with all of my dirty laundry, boyfriend drama, sibling bickering, and that one time I threw a party, it’s time to thank you for putting up with my teenage angst and feeding me despite your probable desire to have me sleep outside every once in a while. To all of our LA girls celebrating Mother’s Day, we’ve got 10 ways to celebrate Mom this Mother’s Day that will have your mama feeling showered with love. 1. Spa Date – 18+ years of selfless care means it’s mama’s turn to relax! Take her for a mani pedi, massage, facial or all of the above for Mother’s Day! I’m a big fan of The Now Spa where you can experience luxurious pampering at a fraction of the cost. But if you’re taking Mom out for a deluxe experience, try The Spa at Four Seasons Hotel Westlake Village, voted one of the top spas in America by Conde Nast Traveler. Many of LA’s luxury spas have Mother’s Day Specials, so make sure to do a little research before picking your ultimate “spahhhhhhh” day. 2. Brunch – An oldie, but goodie, this treasured Mother’s Day rendezvous is a great way to kick off the festivities and pay Mom back for all of those times she loved you unconditionally. There are hundreds of Mother’s Day brunch specials all over the city. While you could always wine and dine her at your favorite local spot, we’re preferential to Fig & Olive, Le Petit Paris, or Wolfgang Puck at Hotel Bel-Air (all of which have great Mother’s Day Brunch Specials). 3. Flowers – This year, don’t just get Mom a bouquet of flowers, give her a whole field of them! A stroll through the Huntington Gardens and Library will lead you two to a fabulous brunch or enjoy breakfast at the Rose Garden at Descanso Gardens. You could always try something a little offbeat at the James Irvine Japanese Garden where you won’t find brunch but you also won’t find any crowds. 4. Get Wild – Remember when you and Mommy used to visit the crazy animals at the zoo when you were little? Travel back in time and treat Mom to some of those wild creatures this year! The Los Angeles Zoo and Botanical Gardens at Griffith Park is a local favorite, but you could always play with the underwater creatures at Aquarium of the Pacific in Long Beach where you can also enjoy a great Mother’s Day Brunch. 5. Enjoy High Tea – Does your Mother fancy a spot of tea? Maybe, it’s the finger sandwiches she’s after? High tea is a great treat for Mom to get that European feel without leaving her backyard. 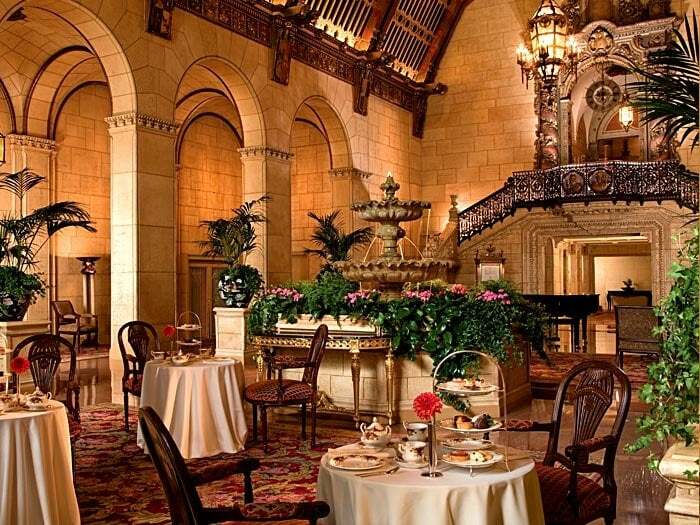 Head to the English countryside-inspired Rose Tree Cottage for your tea or experience Moorish-luxury at the stunning Millennium Biltmore Hotel. 6. Shop Till You Drop – Every lady can always update their wardrobe and Mom is no exception. Maybe you want to live it up on Rodeo Drive in Beverly Hills or perhaps you can treat her to some undiscovered treasures at the Rose Bowl Flea Market. Wherever you choose, Mom will always look down at that special gift and be reminded of you! 7. Wine Tasting – You don’t need to go all the way up to Napa to give Mom some great wine (although, she wouldn’t be mad if you did). Great wine could be found in a myriad of places in the Greater Los Angeles area! Malibu Wines is hosting a Cake and Punch Flower Crown Pop Up event and Danza Del Sol is having a special brunch for Moms! And of course, you can never go wrong at the San Antonio Winery in the heart of Los Angeles. 8. Picnic at the Beach – Sometimes, all mama needs is to spend some time with her kids. No fancy frills, no expensive price tag. Just you. That’s why packing a basket with your Mom’s favorite snacks and heading to the beach is a wonderful way to enjoy Mother’s Day if you’re looking to save a little dough. Just remember to bring her fabulous beach hat. 9. Enjoy the Best View of Los Angeles – Just like picnicking, a great view of the city will take Mom’s breath away without spending too much money. Head to the Griffith Observatory or the Hollywood sign for an epic view. Or take Mom out for drinks at Perch or The Standard for the most captivating view aglow with the city lights! 10. A Weekend Getaway – Maybe you just want to take Mom and getaway from it all! Enjoy a staycation at a cozy bed and breakfast or live it up at a ritzy five-star hotel. Either way, Mom won’t be able to resist the beautiful American Riviera in Santa Barbara, “America’s Finest City” aka San Diego, California’s “Shangri La” aka Ojai, the gorgeous island of Catalina or the chic coastal town of Laguna Beach. But above all else, shower your Mom with cards, kisses, hugs and love all day long because in reality, the only thing she wants is to spend some time with you!